I do not scrapbook as much as I would life to, however, I really enjoy it when I do make the time. Several months ago I signed up for a Big Picture Classes three-month class called The Mother LOAD. Lain Ehmann teaches the class. The first two month will prepare us to scrap (with some scrapping thrown in) and then in September we will scrap a layout a day. I have taken Lain’s LOAD challenges before and have always enjoyed the motivation to scrap that LOAD gives. So with a great discount, I signed up. It helps me be more aware of the little things. and the list goes on. However I finally chose the reason: Because no matter how much is changing, some things stay the same and I want to remember it all. My layout was really quick. I went to my Photo Binders and found some recent photos of the boys that triggered the reason. I decided I wanted blue embellishments, so I went to my blue bin of embellishments and found the stickers and items I wanted to use. I put this layout together in 20 minutes. Some day I will tell you about Photo Binders that I learned about from Stacy Julian, scrapbooking expert, and her Library of Memories/Photo Freedom method, but right now it just feels great to have scrapped and know the reason why. 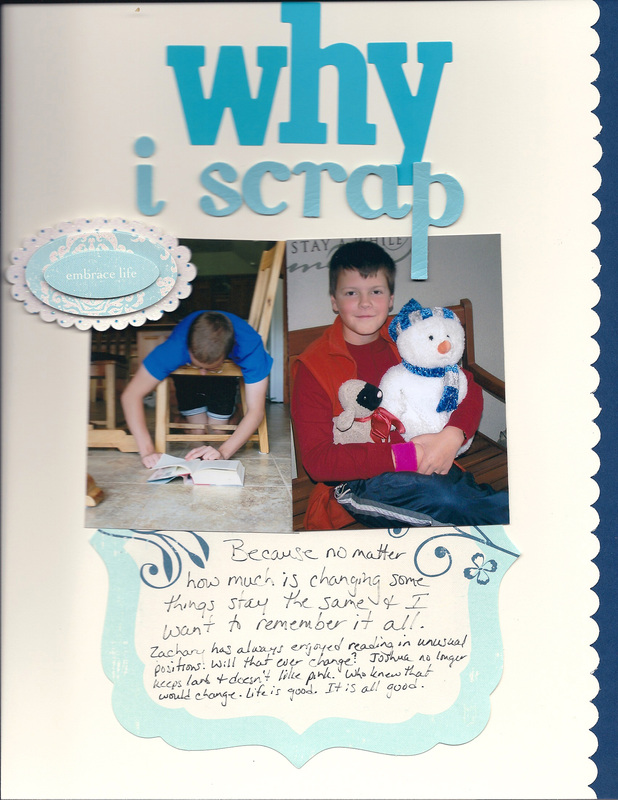 Why do you scrap? Or if you don’t scrap, why don’t you? Journalling: Why I Scrap….Because no matter how much is changing some things stay the same and I want to remember it all. Zachary has always enjoyed reading in unusual positions. Will that ever change? Joshua no longer keeps lamb and doesn’t like pink. Who knew that would change. Life is good. It is all good.